Our Christmas tree is an icon of my dreams. My parents, in their different ways, made it so by the love of their unspoken desires and work of their hands. 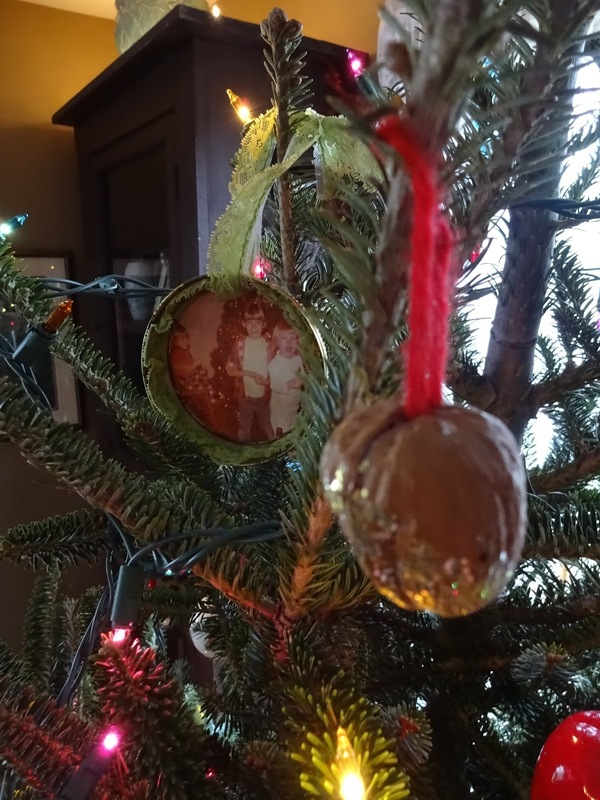 In Dad’s first reels of home movies from 1955, there’s Mom, round with their fourth child, reaching from a ladder over her middle, hanging bulbs at the top our tree. Dad throws tinsel on branches before the three-minute roll runs out. My two sisters and I squint into the rack of bright lights, our smiles in various stages of dental development. We kiss Mom and Dad goodnight, parade off to bed in our pajamas and sponge rollers. T’was the magical night before Christmas. Three years later, my earliest Christmas memory rooted without the aid of Dad’s omnipresent camera. My father insisted he saw Santa and his sleigh flying over the Rivard’s house across the street. “Look! There’s Rudolf’s red nose!” he said. I strained with all my nine-year-old might to see Rudolf’s red glow in the sky, but our tree blocked the view in the picture window. Santa was history by 1960, although I pretended to believe for my younger sisters’ sake. Moody and eleven-years-old, I tore into my presents one after another and displayed the contents for Dad to film according to his directions. Would I have behaved differently had I known my father’s troubles were crumbling the foundation of our family? Dear Reader, his home movies ceased in 1966, the year before he left. All I remember about Christmas is my mother leaving the house in the dark to work a second job. Ours was a broken home. We were broken people. She did her best to mend us. Confused and angry, I hid hope for my parents’ reunion someday. Over fifty years later, I’ve decorated more Christmas trees without my children than with them. There’ve been years I’ve forced myself to hold the gold glittered walnut my departed daughter decorated in Sunday school. The orphaned ornament means I release again the dreams I held for her. I now understand my parents, in all their faults and brokenness, possessed similar dreams and visions, and sacrificed to make them reality. “What do you have if you don’t have your dreams?” Mom often asked. I name those who went before us this year, the loved ones and legacies they left behind. “His yoke is easy, and His burden is light.” Yes, their lives and deaths testify this for our benefit and God’s glory. What does this sacred season promise my family and me? What is my dream for my children and country? God with us. Peace on Earth, good will toward men. Such is the quality of dreams fulfilled.